Skylark : for SSAATTB choir / Sally Greenaway. Instrumentation: A cappella voices: SSAATTB. Lyrics adapted from 'The Skylark' by Christina Rossetti. 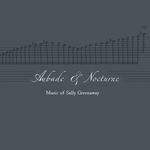 CD: Aubade & nocturne / music of Sally Greenaway.